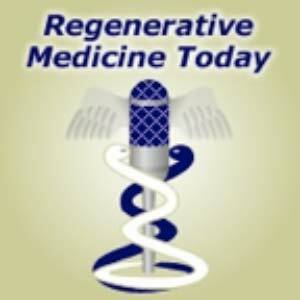 Results of a study conducted by researchers at the McGowan Institute for Regenerative Medicine and the University of Pittsburgh School of Medicine showed significant improvement in strength and range of motion, as well as evidence for skeletal muscle regeneration, in 13 patients who were surgically implanted with bioscaffolds derived from pig tissue to treat muscle injuries. The patients had failed to respond to conventional treatment before use of the extracellular matrix (ECM). The findings were published online in npj Regenerative Medicine. “Previously, there was no effective treatment for these patients, but this approach holds significant promise,” said senior investigator Stephen Badylak, DVM, PhD, MD, professor of surgery at Pitt and deputy director of the McGowan Institute, a joint effort of Pitt and UPMC. “This approach could be a game changer and not just an incremental advance.” Other McGowan Institute for Regenerative Medicine affiliated faculty members participating in the study include: Fabrisia Ambrosio, PhD, Associate Professor in the Department of Physical Medicine & Rehabilitation at the University of Pittsburgh, Neill Turner, PhD, Research Assistant Professor in the Department of Surgery at the University of Pittsburgh, Michael Boninger, MD, UPMC’s Vice President for Medical Affairs for Community Provider Services, and J. Peter Rubin, MD, UPMC Professor and Chair of Plastic Surgery, Pitt School of Medicine. For the Muscle Tendon Tissue Unit Repair and Reinforcement Reconstructive Surgery Research Study, which was sponsored by the U.S. Department of Defense, 11 men and 2 women who had lost at least 25 percent of leg or arm muscle volume and function first underwent a customized regimen of physical therapy for 4 to 16 weeks. Lead study surgeon Dr. Rubin then surgically implanted a “quilt” of compressed ECM sheets designed to fill in their injury sites. Within 48 hours of the operation, the participants resumed physical therapy for up to 24 additional weeks. By 6 months after implantation, patients showed an average improvement of 37.3 percent in strength and 27.1 percent in range of motion tasks compared with pre-operative performance numbers. CT or MRI imaging also showed an increase in post-operative soft tissue formation in all 13 patients. “For well-selected patients with this type of loss, we now have a treatment available to help improve their function,” Dr. Rubin said. 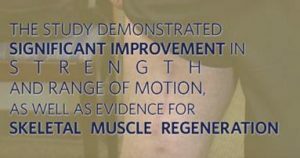 The new data builds upon a previous Pitt study that showed damaged leg muscles grew stronger and showed signs of regeneration in three out of five men whose old injuries were surgically implanted with ECM derived from pig bladder. Those patients also underwent similar pre- and post-operative physical therapy. The recent results included more patients with varying limb injuries; used three different types of pig tissues for ECM bioscaffolds; investigated neurogenic cells as a component of the functional remodeling process; and included CT and MRI imaging to evaluate the remodeled muscle tissue. In this video, study participant Maury Noonan explains how the regenerative medicine procedure and physical therapy aided his recovery. The project was supported by a research grant from the U.S. Department of Defense, grant D11AC00006. The U.S. Department of Defense’s Limb Salvage and Regenerative Medicine Initiative and the Muscle Tendon Tissue Unit Repair and Reinforcement Reconstructive Surgery Research Study are collaboratively managed by the Office of the Secretary of Defense. The initiative is focused on rapidly and safely transitioning advanced medical technology in commercially viable capabilities to provide wounded warriors the safest and most advanced care possible today. Reticular fibers, or reticulin is a type of fiber in connective tissue, composed of type III collagen secreted by reticular cells. Reticular fibers crosslink to form a fine meshwork (reticulin). This network acts as a supporting mesh in soft tissues such as liver, bone marrow, and the tissues and organs of the lymphatic system. Jones Silver Stain demonstrates basement membrane and reticulin. You’ll receive 25% off Jones Silver Stain in August when you mention this ad. Contact Lori at the McGowan Core Histology Lab by email: perezl@upmc.edu or call 412-624-5265. As always, you will receive the highest quality histology in the quickest turn-around time. Nef is a critical HIV-1 virulence factor that enables infected cells to evade the immune response, avoid superinfection, and produce highly infectious virions. Nef accomplishes these goals by hijacking multiple host pathways involved in cellular activation, protein trafficking, and cell surface receptor expression. We have recently discovered small molecules that bind directly to Nef and disrupt its functions in cells, including Nef-dependent enhancement of infectivity, CD4 and MHC-I downregulation and viral replication. In order to study Nef function and test our compounds in vivo, we are developing humanized models for HIV-1 infection. Humanized mice represent a breakthrough model to study HIV infection and immune responses which previously could only be tested in non-human primates. We generated NSG-BLT (NOD scid gamma mice transplanted with human fetal liver and thymus and injected with human CD34+ stem cells) and hu-PBMC NSG (NOD scid gamma mice injected with human PBMC) mouse models for infection with HIV-1 with wild-type or mutant forms of Nef to test the efficacy of our compounds. To validate the successful reconstitution and engraftment of human immune cells in these mice, we collaborated with Lynda Guzik at the McGowan Institute Flow Cytometry Core Facility to design a suitable 8-color flow panel to identify all human PBMC subsets with absolute cell counts in mouse blood, and a 7-color panel for detecting HIV-infected human cells in tissues. Figure 1 shows the human immune cell reconstitution (human CD45+ cells versus mouse CD45+ cells) in an NSG-BLT mouse compared to an NSG mouse without engraftment. Human CD4+ and CD8+ T cells as well as the development of B cells can also be observed (Figures 2 and 3). We then used flow to monitor the progression of human CD4+ T cell depletion (model for AIDS) after HIV-1 infection in mice. Ms. Guzik not only runs our experiments on FACSAria II but also provides expertise on analyses, controls, trouble shooting, and reagent choices. We also appreciate that the McGowan Institute Flow Cytometry Core Facility offers various workshops for new technologies related to flow cytometry. We are currently working on detecting HIV-1 infected cells in tissues and hope to evaluate the efficacy of Nef inhibitors in the infected mice soon. Do not hesitate to contact Ms. Guzik, the Flow Cytometry Facility Manager, for more information on how the Facility’s resources can help you: 412-648-8660 or guzilj@upmc.edu. 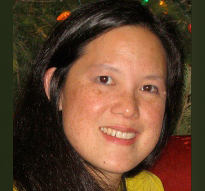 Researchers at the University of Pittsburgh School of Medicine—including McGowan Institute for Regenerative Medicine affiliated faculty member Charleen Chu, MD, PhD, Professor in the Department of Pathology, University of Pittsburgh School of Medicine, where she holds the A. Julio Martinez Chair in Neuropathology—have uncovered a major reason why the Parkinson’s-related protein alpha-synuclein, a major constituent of the Lewy bodies that are the pathological hallmark of Parkinson’s disease (PD), is toxic to neurons in the brain. The finding has the potential to lead to new therapies that could slow or stop progression of the devastating illness. The new research appears online in Science Translational Medicine. Coauthors of the study are Edward Burton, MD, PhD, Teresa Hastings, PhD, Eric Hoffman, PhD, Caitlyn Barrett, PhD, Alevtina Zharikov, PhD, Anupom Borah, PhD, Xiaoping Hu, BS, and Jennifer McCoy, BS, all of PIND. The National Institutes of Health has awarded McGowan Institute for Regenerative Medicine faculty member David Vorp, PhD, the William Kepler Whiteford Professor of Bioengineering and Associate Dean for Research of the Swanson School of Engineering at Pitt, and colleagues with a grant worth more than $1.54 million to fund their study investigating artificial stem cells in the development of engineered vascular grafts. Dr. Vorp is joined on this study by McGowan Institute for Regenerative Medicine colleagues Steven Little, PhD, the William Kepler Whiteford Professor and Chair of Chemical Engineering; William Wagner, PhD, Professor of Surgery and Director of the McGowan Institute; and Justin Weinbaum, PhD, Research Assistant Professor of Bioengineering; along with Pitt colleague Morgan Fedorchak, PhD, Assistant Professor of Opthalmology. Some current regenerative medicine approaches use mesenchymal stem cells (MSCs) harvested from the patient to help rebuild or repair damaged or diseased tissues. Dr. Vorp and his team have pioneered the use of MSCs in the development of tissue-engineered vascular grafts (TEVGs), which may be effective in small diameter arterial bypass procedures or arteriovenous access for dialysis. However, MSCs taken from patients at high risk for cardiovascular disease, such as the elderly and diabetics, may be dysfunctional. Furthermore, the use of harvested cells that require extended culture expansion also runs the risk of cellular contamination or transformation, as well as high costs and substantial waiting time before a graft can be made and implanted. To answer this challenge, the research team has developed artificial stem cells (artMSCs) that are created by encapsulating the veritable cocktail of biochemicals secreted by normally functioning MSCs in culture into biodegradable microspheres that are similar in size to actual MSCs. “By ‘tuning’ or adjusting the degradation rate of the microspheres, we can replicate the release of these biochemicals by real, fully-functional MSCs,” said Dr. Vorp. He and his colleagues will then seed the artMSCs into porous, tubular scaffolds and implant them in a rat model as they have done with MSCs in fabricating TEVGs. 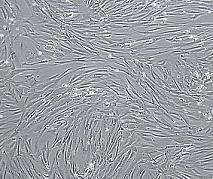 Illustration: Vascular smooth muscle cells, isolated from human aorta, growing and forming a monolayer in cell culture. Wikipedia. ular Therapeutics/Drug Discovery Program at the University of Pittsburgh Cancer Institute, and a Member of the Clinical Research, Investigation, and Systems Modeling of Acute Illness (CRISMA) Center in the Department of Critical Care Medicine at the University of Pittsburgh, and Gilles Clermont, MD, Professor of Critical Care Medicine, of Industrial Engineering, and of Mathematics at the University of Pittsburgh, and the Medical Director of the Center for Inflammation and Regenerative Modeling, University of Pittsburgh, for their proposal titled “Endotypes of Thrombocytopenia in the Critically Ill.” This award is for $275,000 over the next 2 years. Congratulations, Drs. Parker and Clermont! Injecting modified, human, adult stem cells directly into the brains of chronic stroke patients proved not only safe but effective in restoring motor function, according to the findings of a small clinical trial led by Stanford University School of Medicine investigators. Approximately 1/3 of the patients received their treatment at the University of Pittsburgh Medical Center (UPMC). The Pitt portion of the study was under the leadership of Lawrence Wechsler, MD, Henry B. Higman Professor and Chair, Department of Neurology, and Vice President for Telemedicine, UPMC. The patients, all of whom had suffered their first and only stroke between 6 months and 3 years before receiving the injections, remained conscious under light anesthesia throughout the procedure, which involved drilling a small hole through their skulls. The next day they all went home. Although more than 3/4 of them suffered from transient headaches afterward — probably due to the surgical procedure and the physical constraints employed to ensure its precision — there were no side effects attributable to the stem cells themselves, and no life-threatening adverse effects linked to the procedure used to administer them, according to a paper, published online in Stroke, that details the trial’s results. The promising results set the stage for an expanded trial of the procedure now getting underway. They also call for new thinking regarding the permanence of brain damage, said Gary Steinberg, MD, PhD, professor and chair of neurosurgery, Stanford. Dr. Steinberg, who has more than 15 years’ worth of experience in work with stem cell therapies for neurological indications, is the paper’s lead and senior author. University of Pittsburgh’s 2016 Beckman Scholar—senior Uma Balakrishnan—is working toward a medical career and seeks to make significant contributions to research in human tissue engineering. Ms. Balakrishnan’s research focuses on finding new methods for producing high-cell density tissues in laboratory settings. Working within the lab of McGowan Institute for Regenerative Medicine affiliated faculty member Lance Davidson, PhD, Associate Professor and Wellington C. Carl Faculty Fellow in the Department of Bioengineering, she is looking for alternative methods of tissue generation, which could have an impact in organ repairs and transplantation. 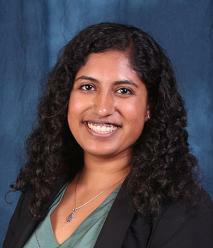 A native of Iowa City, Iowa, Ms. Balakrishnan, a Pitt Chancellor’s Scholar, founded the University of Pittsburgh Rotaract Club, a program of Rotary International. She serves as a University Honors College Ambassador and an executive board member of the Theta Tau professional engineering fraternity. She also has studied abroad at the University of Alcalá in Spain and the University of Economics and Finance in Vietnam. Ms. Balakrishnan would like to become a clinician scientist at a major academic medical center. A 3-year institutional grant, the Beckman Scholars Program Award supports large-scale endeavors of student researchers selected by the awarded institution. It is widely considered one of the nation’s foremost scholarships for preparing undergraduates for careers in the life sciences. The Beckman Scholars Program Award was granted to Pitt in the spring of 2015. The scholarship provides as much as $26,000 in funding for 16 months of research, consisting of two consecutive summer semesters as well as the intermediate academic year. Scholars present their work to Pitt’s Beckman Scholars Steering and Selection Committee as well as at national conferences and in scholarly journals. Pitt’s University Honors College oversees the University’s Beckman Scholars Program. Established in 1977, the Arnold and Mabel Beckman Foundation is an independent, nonprofit organization that promotes research in the life-science fields. McGowan Institute for Regenerative Medicine affiliated faculty member Freddie Fu, MD was inducted into the American Orthopaedic Society for Sports Medicine’s (AOSSM) Hall of Fame during the Society’s Annual Meeting in Colorado Springs, Colorado. AOSSM Hall of Famers are individuals who have made a substantial contribution to the sports medicine field. 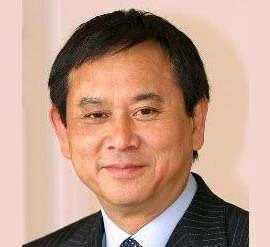 Dr. Fu is a Past AOSSM President and the David Silver Professor and Chairman of the Department of Orthopaedic Surgery at the University of Pittsburgh School of Medicine. He specializes in sports medicine and holds secondary appointments as Professor of Physical Therapy, Health and Physical Activity, and Mechanical Engineering and serves as the Head Team Physician for the University of Pittsburgh Athletic Department. In 1999, he was awarded an honorary Doctor of Science degree from Point Park University, an honorary Doctor of Public Service degree from Chatham University, and in 2010 was appointed Distinguished Service Professor by the University of Pittsburgh. 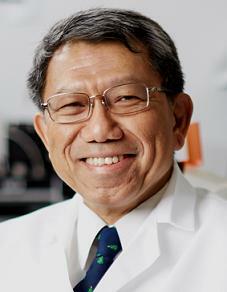 Dr. Fu received the 2014 Kappa Delta Elizabeth Winston Lanier Award for “Anatomic ACL Reconstruction: A Changing Paradigm” presented by the Kappa Delta Sorority and the Orthopaedic Research and Education Foundation (OREF) and received it at the 2014 Annual Meeting of the American Academy of Orthopaedic Surgeons (AAOS). Dr. Fu’s major research interest lies in anatomic ACL reconstruction, clinical outcomes, and bioengineering of sports-related problems. Dr. Fu has been honored with more than 260 professional awards and honors, made over 1,150 national and international presentations, co-authored 173 books chapters, is an author of over 570 peer-reviewed articles, and edited 30 major orthopaedic textbooks. He is a member and has held offices in numerous academic organizations, including the Herodicus Society and the American Orthopaedic Association. He has served as President of the Pennsylvania Orthopaedic Society, AOSSM and the International Society of Arthroscopy, Knee Surgery and Orthopaedic Sports Medicine (ISAKOS). He has held board positions with the Arthroscopy Association of North America and the Orthopaedic Research and Education Foundation and AOSSM. The University of Pittsburgh has dedicated $1 million in gap funding over the next 2 years to assist Pitt innovators seeking to commercialize their research discoveries. Coordinated through the University’s Innovation Institute, the Chancellor’s Innovation Commercialization Funds will assist faculty and students with Pitt discoveries in identifying unmet needs in the market for their innovations, developing prototypes, identifying potential commercial partners, or forming a new enterprise. 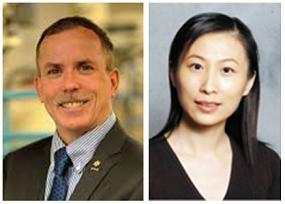 Two McGowan Institute for Regenerative Medicine affiliated faculty members received funding through the Pitt Ventures program. Pitt Ventures is the Innovation Institute’s program assisting Pitt innovators in moving their innovations through the multiple stages of development toward commercialization. The new funding will provide $400,000 in additional support for this initiative over the next 2 years targeted at innovators participating in the Pitt Ventures Gear Commercialization Program. This includes the upcoming Michael G. Wells Student Healthcare Entrepreneurship Competition and the Kuzneski Innovation Cup, which is focused on non-health care innovations. Description: Pressure sores result from individuals sitting in wheelchairs and not performing frequent-enough weight shifts due to reduced or absent nerve sensation. The resulting ulcers are a significant health concern with negative effects on quality of life and expensive treatments. While the HERL team previously developed a tool to assist those in motorized wheelchairs, until now a solution for those in manual wheelchairs was not available. Description: The VIP Wheelchair is a control system to improve power wheelchair driving accessibility, independence, and safety for people with vision and mobility impairment. The wheelchair incorporates a number of feedback and control mechanisms to help visually impaired users avoid obstacles and drop-offs. “More faculty and students are engaging with the Innovation Institute every year. Through the Chancellor’s Innovation Commercialization Funds, we will be able to meet the rising demand from our Pitt innovators and help them speed the path to market for their discoveries,” said Innovation Institute Founding Director Marc Malandro. #161 –– Dr. Tarek Fahmy is an Associate Professor of Biomedical Engineering and Immunobiology at Yale University. Dr. Fahmy discusses his research in biomaterials for drug and antigen delivery to the immune system. 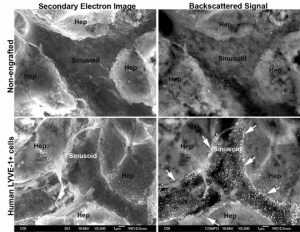 Immuno-SEM evaluation of humans specific LYVE-1 + sinusoids in repopulated mouse liver at low magnification. Bottom panels show a set of human LYVE-1+ cells as determined by strong backscattered signal within the sinusoid (white puncta representing 20 nm gold-conjugated goat anti-rabbit LYVE-1, within the arrows) Top panels show no backscattered signal indicating there is no human LYVE-1+ cells in this sinusoid. Hepatocytes (Hep) also do not stain for LYVE-1. El Filali, EE, J Hiralall, HA van Veen, DB Stolz, J Seppen. Human liver endothelial cells, but not macrovascular or microvascular endothelial cells engraft in the mouse liver. Cell Transplant. 22(10):1801-1811. 2012. PMID: 23044355. Summary: Volumetric muscle loss (VML) is a severe and debilitating clinical problem. Current standard of care includes physical therapy or orthotics, which do not correct underlying strength deficits, and surgical tendon transfers or muscle transfers, which involve donor site morbidity and fall short of restoring function. The results of a 13-patient cohort study are described herein and involve a regenerative medicine approach for VML treatment. Acellular bioscaffolds composed of mammalian extracellular matrix (ECM) were implanted and combined with aggressive and early physical therapy following treatment. Immunolabeling of ultrasound-guided biopsies, and magnetic resonance imaging and computed tomography imaging were performed to analyse the presence of stem/progenitor cells and formation of new skeletal muscle. Force production, range-of-motion and functional task performance were analysed by physical therapists. Electrodiagnostic evaluation was used to analyse presence of innervated skeletal muscle. This study is registered with ClinicalTrials.gov, numbers NCT01292876. In vivo remodelling of ECM bioscaffolds was associated with mobilisation of perivascular stem cells; formation of new, vascularised, innervated islands of skeletal muscle within the implantation site; increased force production; and improved functional task performance when compared with pre-operative performance. Compared with pre-operative performance, by 6 months after ECM implantation, patients showed an average improvement of 37.3% (P<0.05) in strength and 27.1% improvement in range-of-motion tasks (P<0.05). Implantation of acellular bioscaffolds derived from ECM can improve strength and function, and promotes site-appropriate remodelling of VML defects. These findings provide early evidence of bioscaffolding as a viable treatment of VML. Source: npj Regenerative Medicine. 21 July 2016. Description: Thrombocytopenia is extremely frequent in critically ill patients. However, the role of acute platelet responses in critically ill patients is not well studied, and the multifactorial etiology of thrombocytopenia in the ICU makes it difficult to understand, or understand whether or not to treat it. In several situations such as traumatic injury or sepsis, very low platelet counts have been to bleeding, thrombosis and end-organ injury. Platelets have been extensively studied as a key component of hemostasis, but a rapidly emerging concept is that platelets are also key effector cells in systemic inflammatory processes as both instigators of local and systemic inflammatory reactions and also participants in the inflammation that contributes to tissue injury. The link between platelets and inflammation is complex and bidirectional, as inflammatory ligands have been shown to regulate platelet function and activated platelets induce inflammatory responses in other cell types. The overarching theme of this proposal is to study platelet dynamics in critically ill patients, construct clinical endotypes of thrombocytopenia in this population, and to relate these endotypes to underlying mesoscale mechanisms through computational modeling. We will use a large electronic health record-based database and a tri-state trauma database as source data to construct these endotypes. We define endotype as clinical patterns defined along four dimensions: (1) baseline information (demographic, chronic disease burden, severity of illness and admitting diagnosis), (2) features of the platelet count time series (rate of decrease, nadir, etc. ), (3) concurrent interventions, and (4) outcome. The computational approach will attempt to root clinical endotypes in mechanistic interpretations (or collections of alternative interpretations), contributing to focus basic science investiagtions, and to close key knowledge gaps preventing the design and use of targeted anti-platelet-inflammatory therapies in the critically ill. Computational models will be developed at different levels of complexity, with a specific attention to tie underlying mechanisms to functional assays routinely performed in thrombocytopenic patients, such as prothrombin time, activated coagulation time, and thromboelastogram.